On the auspicious day of Shri Krishna Janmashtami, 15th August 1938, the people of Ghatkopar and the surrounding suburbs witnessed the birth of Hindi Vidya Prachar Samiti, a brain child of a visionary Late Shri Nandkishore Singh Jairamji. The Samiti was established with the objectives of catering to the educational needs of the Hindi speaking community. It made a humble beginning by starting a primary school, which gradually expanded into a full-fledged secondary school. The Hindi High School with its high academic standards has carved for itself a place not only among leading secondary schools in Mumbai but also educational institutions imparting instructions in Hindi throughout Maharashtra. With its primary objectives achieved the Samiti decided to extend its frontiers and broaden its horizons. As a result, Ramniranjan Jhunjhunwala College came into existence in 1963, enabling a larger section of the society to take advantage of the facilities provided for higher education. In 1976 the Junior College section was introduced and in 1981 the Commerce faculty commenced both at the Junior and Degree College level. From 1999-2000 the College has added a number of self-financing courses like BMS, B.B.I, B.Sc. in C.S., I.T., Biotechnology, M.Sc. in Computer Science and Biotechnology as well as add on courses, which further hone the special skills of the students. In 2014 saw a change in education system with greater emphasis being given to employability of youth. As an effort to realize the dream of Make in India, Digital India, Clean and Green India, we have started skill based program supported by University Grants commission known as Bachelor in Vocation. 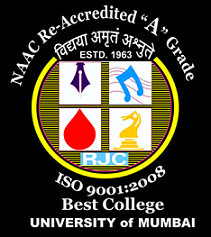 The college has been reaccredited with ‘A’ Grade by NAAC in 2014 with a CGPA 3.50 and received the Best College Award (2007-2008) of the University of Mumbai. The College has been bestowed with IMC RAMKRISHNA BAJAJ PERFORMANCE EXCELLENCE TROPHY, 2010. The Principal of the college was awarded “Best Teacher” by Government of Maharashtra in 2011. Government of Maharashtra conferred the college with “JAAGAR JAANIVANCHA” (First in Mumbai Suburban- in 2013 and Second in Mumbai Suburban- in 2014) for safety of girls. To empower students through focused teaching and research. To Foster a world of joy through sharing and learning. To create and enhance teamwork and leadership qualities. To excel in interaction through the art of communication. To provide extension services to serve self and society. Academic excellence with character development. Enthusiasm is the propelling force behind our success.